This is a cake to bake when you want to celebrate Spring. This is a hummingbird cake which is a great way to salute Spring. I’ve had the recipe for years from an old ‘Martha Stewart Living’ magazine but I had never made it. This weekend, I was looking at my actual hummingbird feeders and for some reason decided to make the hummingbird cake. I guess I will do anything to get a hummingbird to come live on Glen Road. Other than this cake, we have not been given this opportunity in the six years we’ve been here. I guess the cake will have to do at this time. Does anyone know the reason they call this cake a hummingbird cake? My clipped recipe says that its delicious taste makes people who eat it hum with delight. It also says that it is as sweet as the sugared water that attracts its namesake. All I can say is that this is a delicious cake. 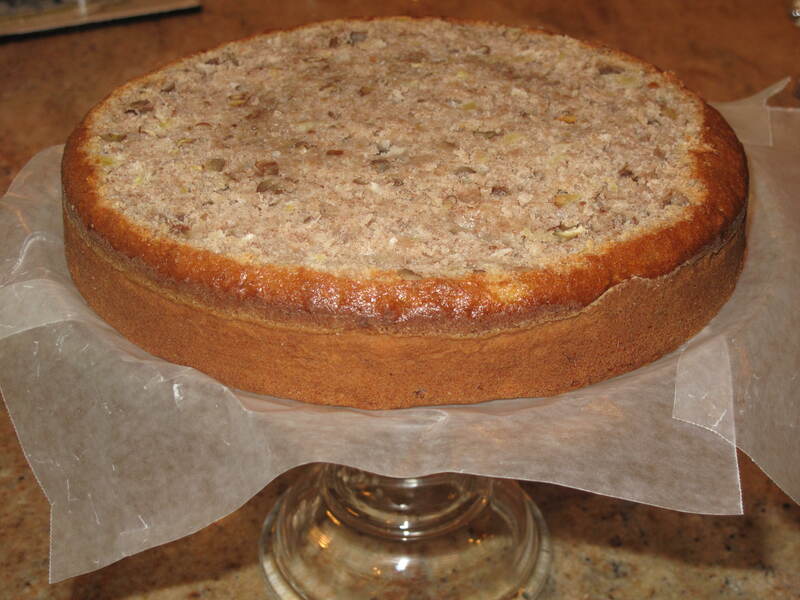 The cake itself mixes pineapple, pecans, bananas and coconut into a thick, rich batter. It is frosted with a delicious cream cheese frosting. 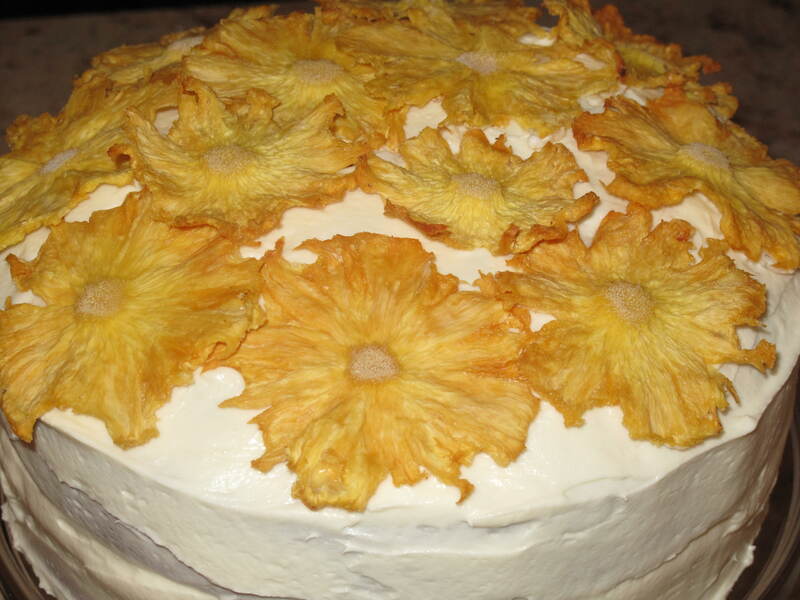 I even took the extra step of making elegant dried pineapple flowers to put on top of the cake. While the pineapple flowers look difficult, they are actually quite easy. If you have some spare hours or are obsessed in making an elegant cake statement, the hummingbird cake is for you. Again, it’s not quick, but it is super delicious. I wrapped my head around making this cake by thinking of doing it in three stages: making the pineapple flowers, proceeding to making and baking the cake and then finishing the cake by frosting it. 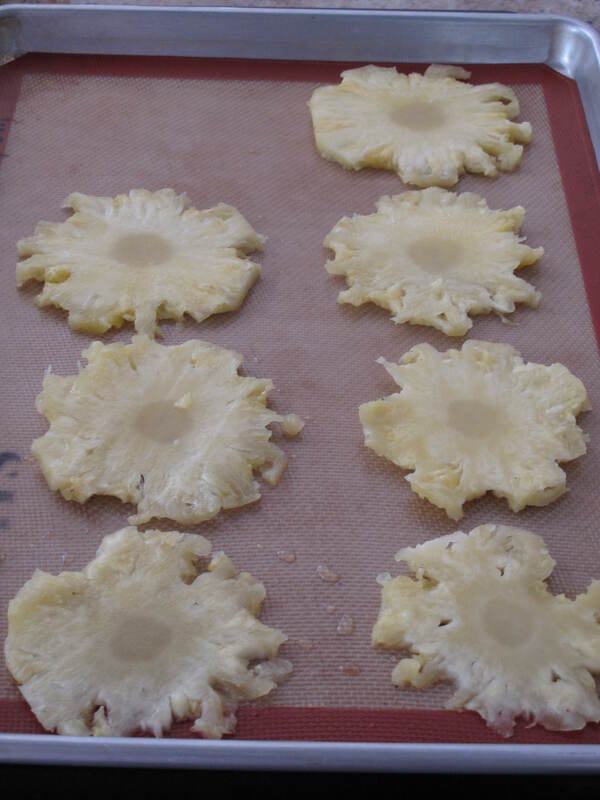 Let’s start with step one and make the dried pineapple flowers that are used for decorating the top of the cake and are edible as well. Preheat oven to 225 degrees. Line baking sheets with Silpats (French nonstick baking mats) or parchment paper. Peel pineapple(s). Using a small melon baller, remove and discard “eyes”. Slice pineapple very thin. Place slices on baking sheets. Cook until tops look dried, about 30 minutes. Flip slices; cook until completely dried, 25 to 30 minutes more. Cool on a wire rack. You can refrigerate the flowers in an airtight container up to 3 days. Note: For me, the cooking process took about twice as long, most likely due to the fact that my slices were not super thin. Continue baking the flowers until they feel dry to your touch. If you take them out and they still feel moist, they are not done yet and need to go back into the oven. 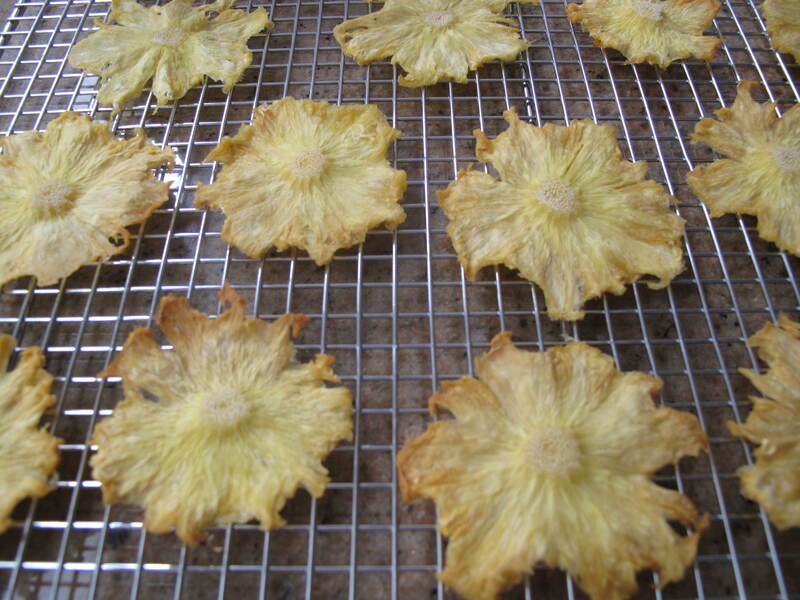 Here are the flowers after drying is complete. Step two, let’s make and bake the cake. Preheat oven to 350 degrees, with rack in the center. 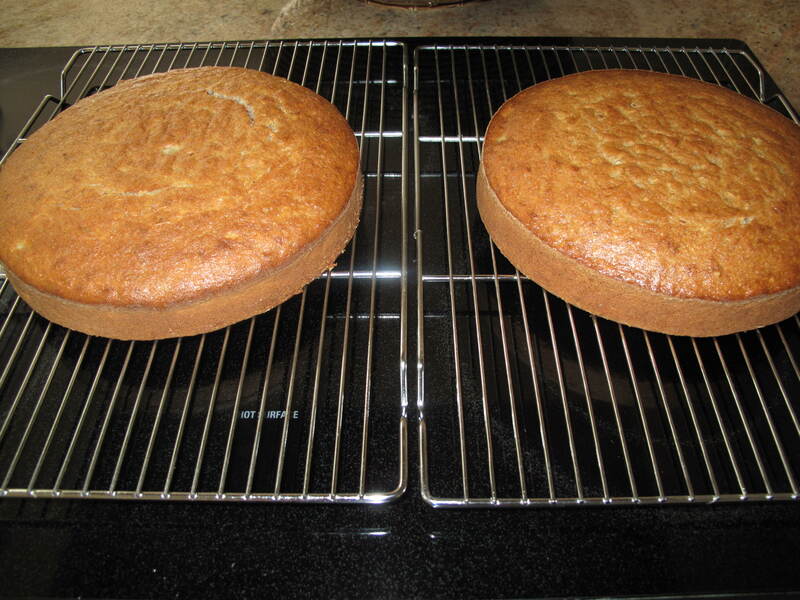 Butter two 9-by-2-inch round cake pans. Line the bottoms of the pans with parchment paper. Butter paper and dust the pans with flour, tapping out any excess. Set aside. 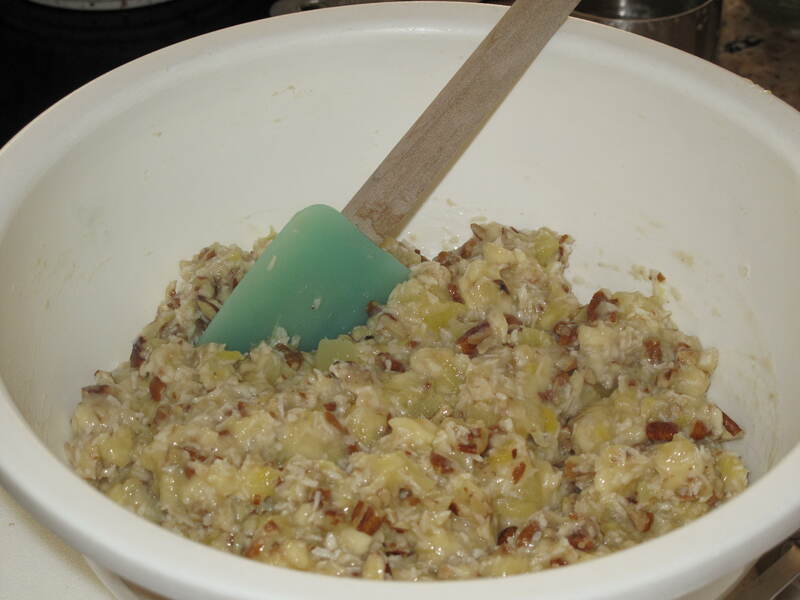 In a medium bowl, mix together banana, pineapple, pecans and coconut. 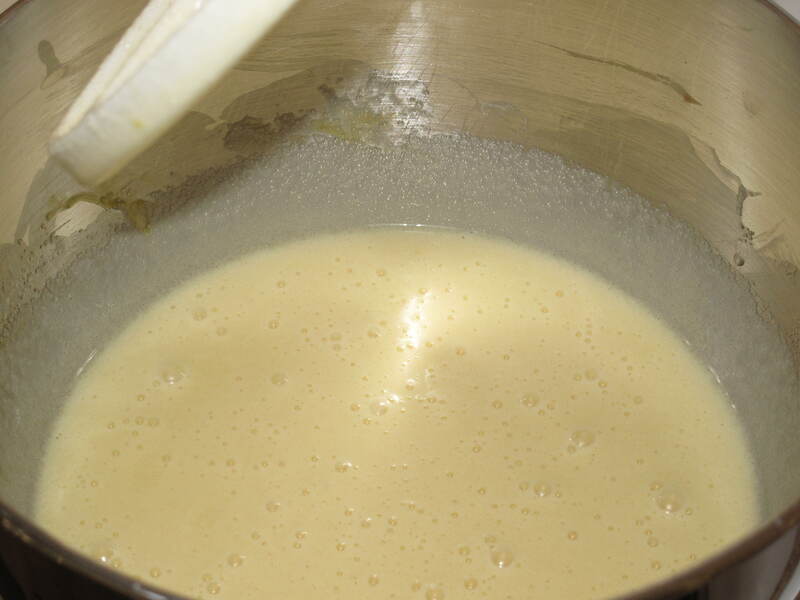 Add to egg mixture; stir until well combined. Add flour mixture; blend well. Divide batter between pans. Bake, rotating pans halfway through, until golden brown and a cake tester inserted in the center comes out clean, 30 to 40 minutes. Transfer pans to a greased wire rack. Let cool 15 minutes. Run a knife around edges to loosen. Invert onto racks; reinvert, top side up. Cool completely. 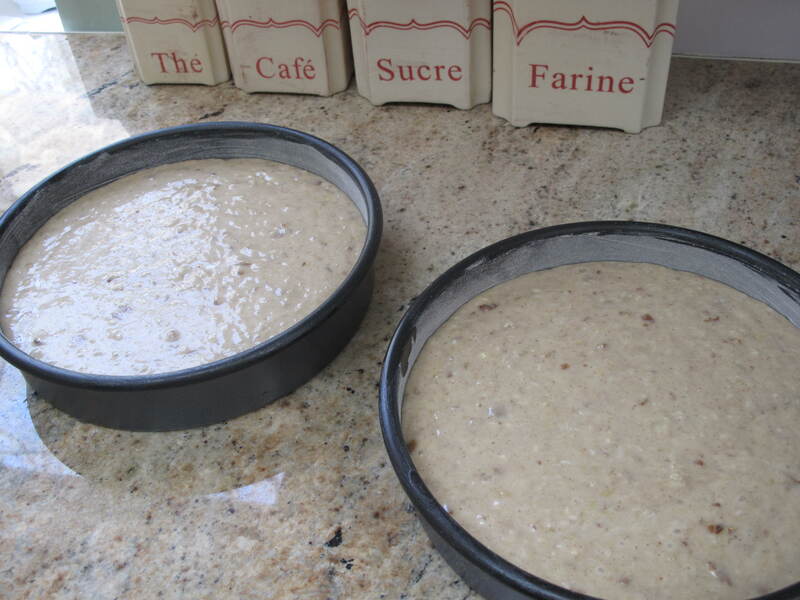 Assemble cake, or wrap each layer well and freeze (thaw before using). We are almost there. 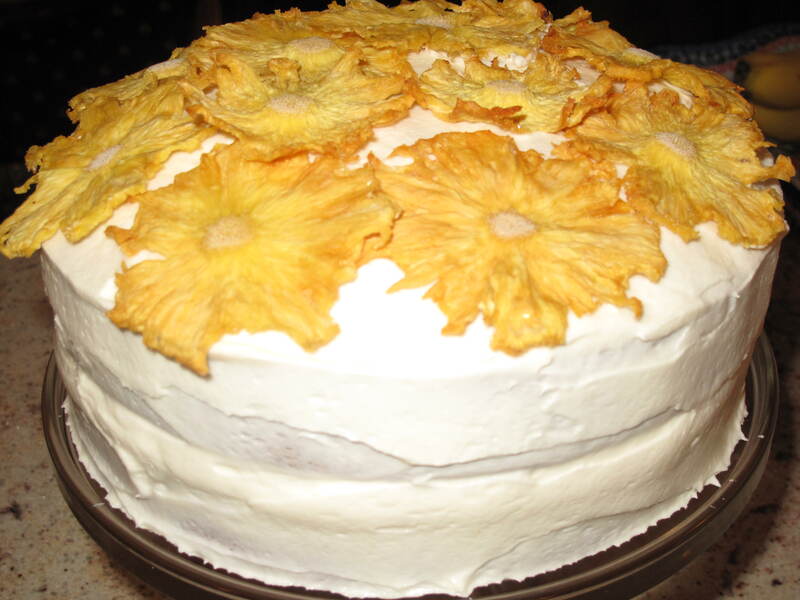 Let’s finish with making the cream cheese frosting and putting it on the cake followed by the pineapple flowers. In the bowl of an electric mixer, beat cream cheese and vanilla until light and creamy, about 2 minutes. 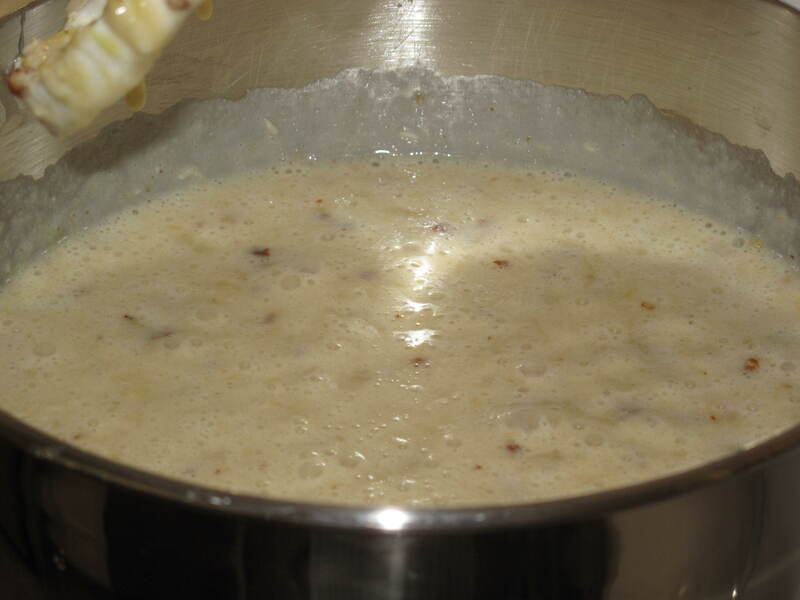 With mixer on medium speed, gradually add butter, beating until incorporated. Reduce mixer speed to low. Gradually add sugar, beating until incorporated. With a serrated knife, trim and discard rounded top off one layer. Place layer on serving platter. I like to put the bottom layer on top of small rectangles of waxed paper that hang over the side of the cake stand. When frosting, the wax paper catches any wayward frosting. When you are done frosting your cake, pull the wax paper away from the cake/cake stand and you will have a sharp edge on the bottom layer and a clean cake stand. Using an offset spatula, spread top of layer with 1/4 inch of frosting. Top with other layer. Frost sides and top of cake with remaining frosting. Decorate with pineapple flowers, if desired. Serve at room temperature. Cake can be refrigerated up to 3 days. We’re done. Take a minute to catch your breath and then dig in to a slice of this delicious cake. You and your friends and family will not be disappointed. Why not spend some time to salute Spring in the right fashion? Bake this hummingbird cake and show Spring how much you love her. We sure are glad that we did. What other Springtime desserts do you make at your home? This entry was posted in Food and tagged Baking, Blog, Cooking, Food, Photos, Recipes, Spring. Bookmark the permalink. 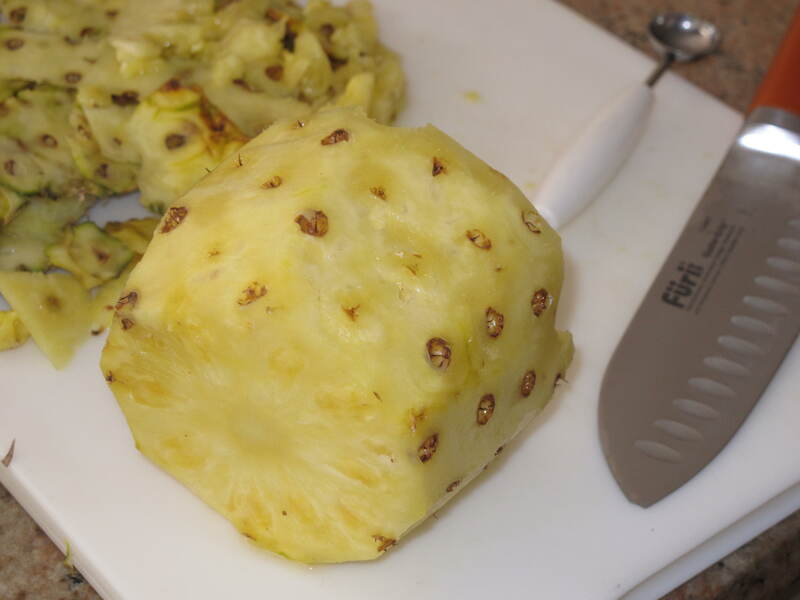 Wow, you dried the pineapple yourself. Great recipe. I’ve never had this and want to try it. Will have to wait for a dinner party though. That’s a lot of cake for two people. Hi Rufus’. It is a lot of cake to eat. I need to go on a diet with all the cake I’ve been eating. Have fun with the recipe. The finished product is amazing. It is really a pretty cake. Just the ingredients alone sells the cake. Would love to taste it. You really outdid yourself this time. Beautiful cake and I know it has a taste to die for.